Vets for Change – Nobody can do everything but everone can do something! Vets for Change were established in 2012 to support local communities, State organisations, NGOs and local charities with our specialist knowledge in organising, planning and executing vaccination and sterilisation campaigns. Vets for Change became a fully registered UK charity (Registered UK Charity Number 1161625) in 2015. Our previous experiences around the world have shown us that whilst local organisations and charities often had the need for animal welfare campaigns they lacked the expertise required to make them a success. Our main goal is to supply these communities’ projects with the financial and logistical support that they need in order to succeed. Vets For Change is an international group of dedicated volunteers from all walks of life whose sole aim is the improvement of the relationships between dogs and their human neighbours through anti-rabies vaccination campaigns, humane dog population control and education. The key to our success is the experience we have running projects around the world. This practical expertise, along with support from a number of internationally renowned NGOs gives us everything we need to help provide healthy and stable dog populations where ever we work. Not by removing dogs from the streets but to vaccinate and sterilize them and then put them back where they belong! Education is one of the most important areas for us. Children are unfortunately the victims in the vast majority of rabies cases. They are the victims but also the answer to the problem, teaching them the true value of the animals in their community is the only way to ensure harmony between man and his faithful companion. With your help the next generation will know more about the risks of rabies whilst enjoying the many benefits of responsible dog ownership! We believe in the ‘One Health’ approach to eliminate rabies. Meaning that all relevant organisations and professions should work together locally, nationally and globally towards a single goal. This ensures the best result for people, animals and the environment. Nina graduated from Onderstepoort in 2012 and started working with wildlife, predominately wild carnivores. Whilst the work was fascinating and the animals unique to work with, something was missing. 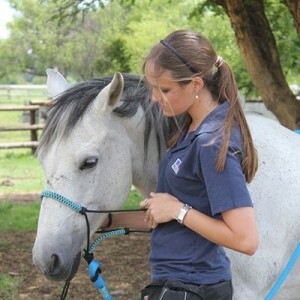 After her involvement with a ‘mini’ Rabies campaign in Mpumalanga in September 2013 where she worked alongside the Mpumalanga State Veterinary Services and local welfare organisations, she decided to change her focus back to small animals, horses and welfare. Nina is the local co-ordinater for Project Mpumalanga and spends her time as chief fundraiser for ‘Vets for Change’. Lorna has a degree in Zoology from Trinity College Dublin, where she has developed her interest in wildlife conservation and epidemiology. After this she moved to Budapest and fulfilled her goal to become a Veterinary Surgeon. Currently she is working in small animal practice in London in an emergency private hospital, gaining a wealth of experience in new surgical and diagnostic techniques. She has worked in a wide range of charity hospitals in the UK and is currently affiliated with an RSPCA shelter in North London. 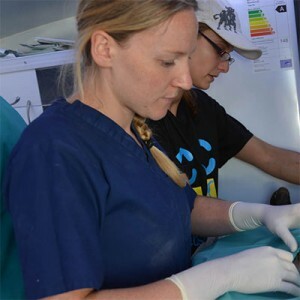 Lorna joined the Limpopo mass rabies and sterilising campaign in 2014 and since then has been keen to continue her volunteer work with Vets for change. Carl retired from the 9 to 5 rat race in 2012 in an attempt to readdress his work/life balance and seek a more personally fulfilling life. Getting involved in the charity sector means that his work/life balance is possibly not working out as he imagined but life is definitely more fulfilling! 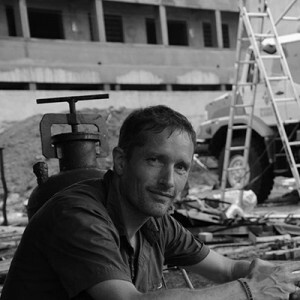 Carl deals with all aspects of Vets for Change, he is chief website geek, designer, anaesthetist, designated driver, top dog darter and tent erector! Davide graduated with distinction in Veterinary Medicine from Bologna University in 1988. Four years later he completed his training as a Specialist in Clinical Medicine and Pathology of Companion Animals (Pisa University). In 2005 Davide obtained his diplomate status in the European College of Veterinary Clinical Pathology and in 2010 he discussed his PhD thesis about a study on bronchoalveolar washing standardization in the dog (Perugia University). As a self-employed vet, he currently works in some veterinary clinics in the North of Italy in the field of respiratory and ENT diseases, endoscopy and diagnostic cytology. Chrissy is a fully qualified veterinary nurse based in the UK. Prior to this she gained her BSc in Animal Welfare and Management. She has worked in a range of practices including charity and referral, and also taught at a nursing college. All of these work places gave her the skills needed to volunteer for international charities, working in countries such as India, Gambia, Greece, Armenia, India, Thailand and Spain! 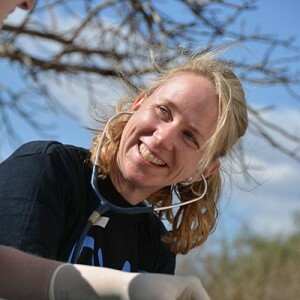 In April 2014 Chrissy volunteered with Vets for Change for the Mpumalanga vaccination campaign and then again for the vaccination and sterilisation campaign in Limpopo in July 2014 and is now a core member of the team. Maxi is a qualified veterinary nurse based in Munich, Germany. Maxi has been actively involved in animal charity work since his first project in Romania 2012. Maxi was part of the core VFC team during the Mpumalanga vaccination project last year. His main tasks were helping to set up the camp, looking after the local and international volunteers and he was heavily involved in the day to day running of the campaign. 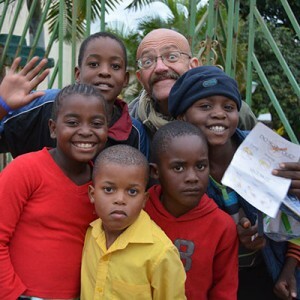 Maxi is now a permanent member of the team and in 2015 he will help with the organisation of the projects, fund raising in Germany and he will again join the next Mpumalanga campaign. We’re always keen to hear from anyone who can help, contact us if you’re interested in joining us on future adventures. £20 will neuter a dog, saving it from a life of endless mating, being mated, giving birth, raising puppies of which a large percentage dies and they are also protected from getting sexual transmitted cancer. You can make a donation using PayPal with the link below, by sending money to [email protected] or via our bank account.